Stay tuned for the Spin Recording Studios blog updates. - Marc Roberge from O.A.R. recently booked studio A to re-record vocals for O.A.R. 's song Shattered. Vocal session was engineered and coproduced by Johnny Nice. - Doyle Wolfgang von Frankenstein (formally of the Misfits) has been in recently tracking and mixing for his second upcoming release. Sessions engineered by Nik Chinboukas. - Leslie Odom Jr. has been in studio A tracking for his upcoming release. - IKILLYA tracking in studio A and overdubbing in studio B recently. Ultimate Classic Rock​ has just debuted the song 'Anymore' from Joel Hoekstra's 13 - Dying to Live (available 10/16 on Frontiers Records). Check it out! Joel Hoekstra is best known these days for being the guitarist in Whitesnake, but is also well known for his work with Trans Siberian Orchestra, Night Ranger and the hit show Rock of Ages! - Sara Bareilles, tracking for the American Repertory Project, Waitress in studio A this past week. - Jane Getter mixing with producer Adam Holzman. Engineered by Anthony Routolo. - Yamaha was in studio A, shooting promotional video for a new Yamaha guitar product with yamaha artists, Alex Skolnick and Mike Stern. 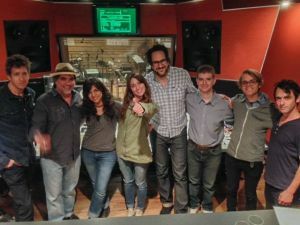 - Emilio Solla was recently in studio A producing Cristina Pato and her Migrations band for a upcoming release. Engineered by Nik Chinboukas and assisted by Yosimar Gomez. - Acrassicauda has been in studio A recently recording their followup entitled Gilgamesh. Engineered and produced by Nik Chinboukas. Assisted by Yosimar Gomez.